I added categories to this blogger blog a while ago (because they weren't there, and because I thought that some people might not want to read about computing - shocking, I know!). 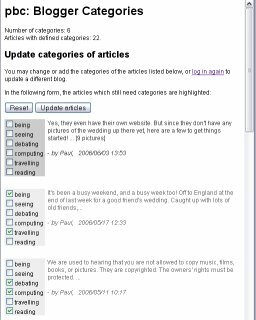 Then I thought I needed an easier way to edit the categories than fiddling with the blog's template, so I wrote a wee script to do all the fiddling. Unfortunately it didn't seem to work - or so I thought - so I left it for a while. When I came to look at it again, lo and behold, it had been working all along. The template was indeed being updated with the new categories. 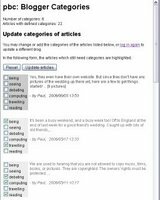 I'd just forgotten that updating a template on its own was no good - The old pages would still be sitting there, serenely unaffected by any new but unused template. I needed to republish the blog as well. I felt a bit silly.